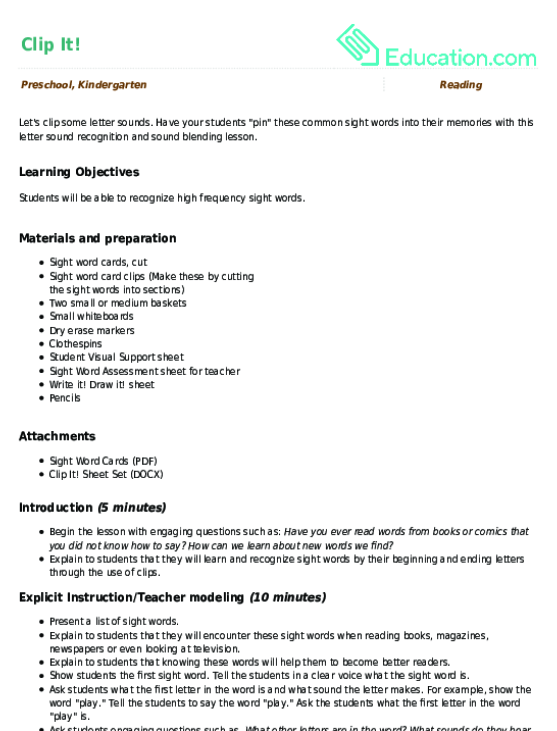 Students will be able to recognise high frequency sight words. Begin the lesson with engaging questions such as: Have you ever read words from books or comics that you did not know how to say? How can we learn about new words we find? Explain to students that they will learn and recognise sight words by their beginning and ending letters through the use of clips. 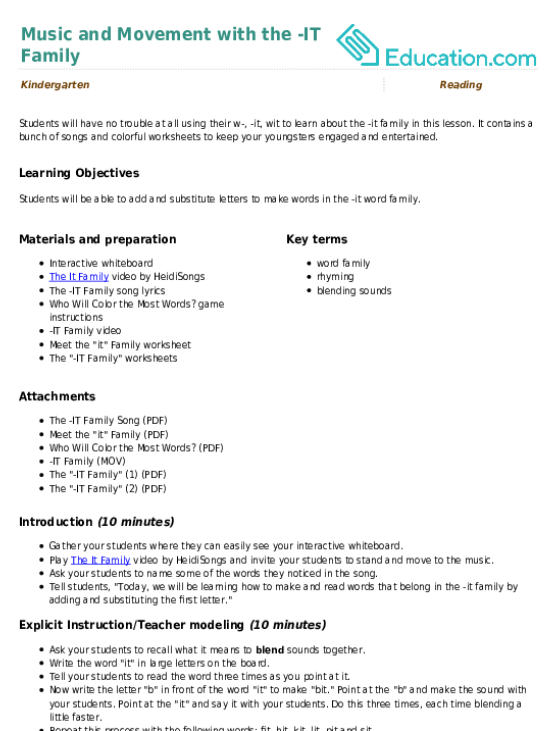 Present a list of sight words. Explain to students that they will encounter these sight words when reading books, magazines, newspapers or even looking at television. Explain to students that knowing these words will help them to become better readers. Show students the first sight word. Tell the students in a clear voice what the sight word is. Ask students what the first letter in the word is and what sound the letter makes. For example, show the word "play." Tell the students to say the word "play." Ask the students what the first letter in the word "play" is. Ask students engaging questions such as, What other letters are in the word? What sounds do they hear in the beginning of the word? What is the sound the first two letters make? What other letters are in the middle of the word? What letter is at the end of the word? Repeat this process with each sight word in the lesson. Explain to students that they will now use sight word cards to form the same words that were reviewed moments ago. Tell students that all sight words have been cut and placed in a designated basket. Explain to students that the sight word they choose is missing the beginning or ending letter. 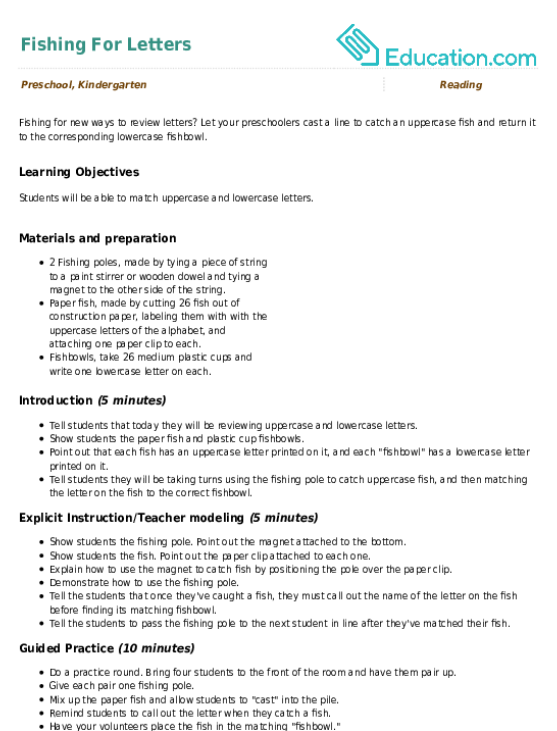 Ask students to pair up. Have each pair pick a word from the basket. Ask students to find a clip from the other basket that can complete the beginning or ending of the word. Ask students to say the beginning letter first then add the rest of the sounds to the word. Ask students to add the clip to the beginning of the word using a clothespin, once they say the entire word. Tell students to say the entire word and then say the ending when they add the clip. Ask students to write the word and draw a picture of the word on their whiteboards. Have students repeat the activity without a peer. 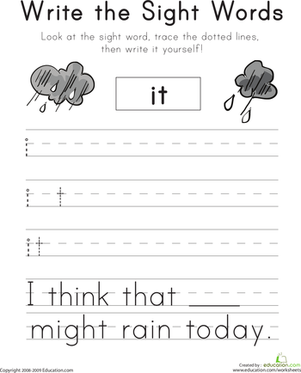 Ask students to write their words and draw picture of them on the Write it! Draw it! sheet. Enrichment:Advanced students can be given opportunities to extend their use of vocabulary words by thinking of extended sentences using the same sight words. If the student wrote a sentence with the sight word "look," the student could be asked to replace "look" with another adjective. Support:Offer struggling students peer support to learn letter and word recognition. Peers behind them can remind them of the letter they landed on and the sound the letter makes (through repetition). In advance, write students' name in the blank spaces of the assessment sheet. During Guided practise and Independent Working Time, walk around the classroom and observe the students as they work. Cross out sight words students cannot recognise. Have students each choose one sight word from the basket. Ask student what word they think it might be. Ask student what letters they need to spell the sight word correctly. Ask student to look for the appropriate clip. 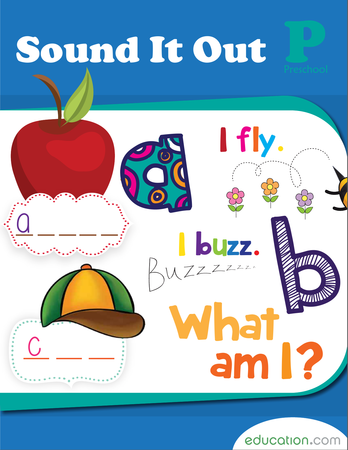 Ask students what sound the letter makes. Ask students to tell you the word. 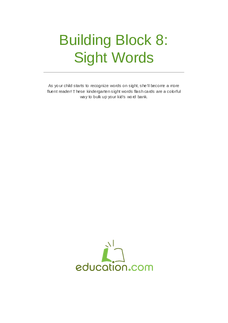 Complete this activity with each student until all of the sight words have been mentioned. Get to know the "it" family! 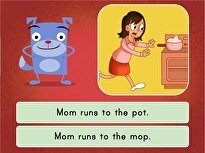 Look at the pictures of words ending in "it," then fill in the missing letter to complete each word. 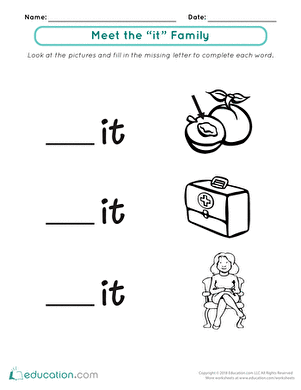 Write the Sight Words: "It"
Help your child learn the sight word "it" with this printable year one phonics worksheet. 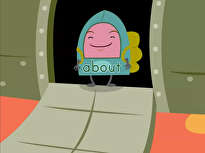 Students will have no trouble at all using their w-, -it, wit to learn about the -it family in this lesson. Z is for Zebra, and it also means your child made it to the end of the alphabet. Have fun coloring this page; you've earned it! Let your preschoolers cast a line to catch an uppercase fish and return it to the corresponding lowercase fishbowl. Y is for Yak, and it means you are almost done! Keep building that vocabulary as you make it to the end of the alphabet. 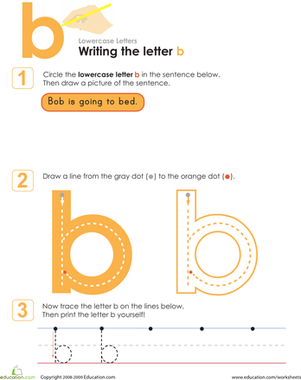 Your child will need to recognise the letter b, trace it, and write it on this lowercase letters worksheet. 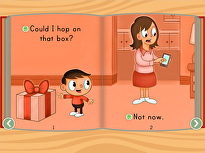 Your child can learn it here and use it for years. colour in the walrus as you move along through the alphabet.